NRMC is a technical and managerial advisory firm in the development sector that provides evidence-based solutions for sustainable, equitable and inclusive development. Established in 2004, NRMC is engaged in creating impactful solutions that make a difference to the society. We achieve results at scale by catalyzing partnership with clients and communities. We believe in ethical business, nurturing talent to be courageous to push the limits of knowledge and discovering new ways of doing things. Landesa partners with governments and local organizations to ensure that the world’s poorest families have secure rights over the land they till. Founded as the Rural Development Institute, Landesa has helped more than 105 million poor families gain legal control over their land since 1967. When families have secure rights to land, they can invest in their land to sustainably increase their harvests and reap the benefits—improved nutrition, health, and education—for generations. The Working Group for women and land ownership (WGWLO), is a network of 41 NGOs, CBOs and individuals in Gujarat, working on the issue of agriculture land ownership from livelihood, security, rights and empowerment angle for women. These are CBOs and NGOs spread in more than 15 districts of Gujarat, working at the rural grass roots level since 2003. The Land Portal Foundation and the NRMC Center for Land Governance partnered with key organizations to hold a series of three webinars on Forest Rights and Governance in India, Land Rights for Slum Dwellers in the East Indian State Odisha: Making technology work for the urban poor and Women Inheriting Land: Rights and Realities, leading up to the third annual India Land and Development Conference (ILDC), which will take place from 12-14 March, 2019. The results of these webinars will inform discussions at respective panel sessions during the conference with the aim of making panel-conversations more nuanced while also ensuring deeper dives into the subject, thereby achieving more actionable results. The ultimate goal of these webinars is to contribute to desirable changes in institutional frameworks and to eliminating barriers that are limiting implementation of legal and policy frameworks, through enhanced awareness and understandings of stakeholders. In addition, these webinars will connect local and global discourse and audiences, with the immediate outcome of enhanced and nuanced appreciation of the issue and more informed actions that contribute to better results. The webinar on Women Inheriting Land: Rights and Realities took place on 22 February. 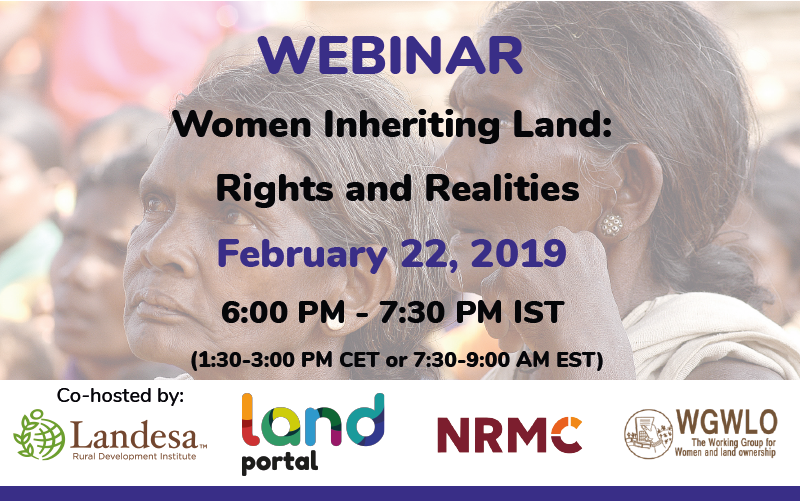 The webinar was co-organized by Landesa and the Working Group for Women and Land Ownership (WGWLO) with support from the NRMC Center for Land Governance and the Land Portal Foundation. Ownership and control over land is essential to ensuring gender equality and improve the quality of lives of not only women, but also of their families and communities. Despite a hoard of international and national commitments, ownership of land continues to be an area with appalling disparities between men and women. An overlapping web of legal, structural, socioeconomic, and cultural factors prevent women from realizing their right to own land. These complexities and the opportunities therein, lay the background of the proposed webinar. The objective of this interactive and dynamic webinar was to discuss the significance of owning land through inheritance, the challenges that prevent women from inheriting land, the opportunities offered through the best practices and the possible actions that can be taken at different levels. Dr. Govind Kelkar, Senior Advisor -women, Land and Productive Assets, Landesa -India. Dr. Hema Swaminathan, Associate Professor, Center for Public Policy IIM – Bangalore. Ms. Niti Saxena, Activist and Researcher, Uttar Pradesh. Dr. Varsha Bhagat-Ganguly, Researcher & former Convener, Working Group on Women and Land Ownership (WGWLO), Gujarat. Why does it matter for women to own land, and why is it important to talk about inheritance in the context? Does land ownership connect in any way to Sustainable Development Goals which we globally aim to achieve? How do laws and policy commitments in India relate to this? What does Indian constitution say? Are there any legal barriers for ensuring women's inheritance rights to land? What do studies in India suggest about the ground reality regarding the same? People often say women themselves don’t claim land, and they write off their share to brothers. I have often seen people saying ‘it will break homes, if daughters start claiming for land’. To what extent do you think is this true? What has been your experience? What are the reasons in India for such significant gaps between the law and the ground reality? Have there been progress/good practices in the country to bridge this gap between the legal commitment and the ground reality? What are they? What are the monitoring mechanism for tracking women's inheritance rights to land are ensured? What could be done at a policy level to ensure and enhance women's inheritance rights to land? Is the government giving enough attention to it?